Mother Celestine Foxworth Thomas, 77, departed this life on Saturday August 18, 2018 in Florence County. She was the mother of Harry Thomas, Ben Thomas, James Thomas, Regina Eiland and Alemeter Williams. You may visit the family at 705 Holiday St. Marion. Service arrangements are scheduled to be held at the Kingdom Hall of Jehovah's Witness 2556 Senator Gasque Rd. Mullins Saturday August 25, 2018 at 1:00pm. Celestine Foxworth Thomas was born in Marion, SC on October 19, 1940 to Herbert Foxworth and Martha Foxworth (Nee Owens). Celestine married Harry Thomas Sr. on September 17, 1957. Celestine’s parents and husband preceded her in death. 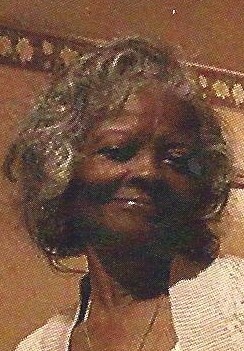 Celestine moved to Pleasantville, New Jersey in 1966 and worked as a caregiver at Our Lady’s Residence for fourteen years. She moved back to Marion, SC in 1980 and worked at Marion Memorial Hospital for over thirty years while also caring for her grandmother and mother-in-law until their deaths. Celestine dedicated her to Jehovah God on January 1, 1978 and joined the Pleasantville Congregation. Celestine demonstrated her love for Jehovah by speaking about him and his promised resurrection to her friends and family. Because of Celestine one of her daughters, her daughter-in-law and three grandchildren dedicated their lives to Jehovah and were baptized. Although Celestine suffered from Alzheimer’s at the end of her life, during her moments of clarity she expressed her love for Jehovah and looked forward to a time when she would live a healthy life in Paradise earth. She loved singing her favorite Kingdom song “Keep Your Eyes On The Prize”. Celestine who was affectionately known as “Tiny Gal” was also known for her exceptional baking and cooking. Her family loved to eat her fried chicken, blueberry dumplings and banana pudding. She was preceded in death by two children: Josephine Ivora Foxworth and Harriet Denise Shannon (affectionately known as Neecy), one grandchild: Clarissa Shaneen Gay (affectionately known as “Baby”). Celestine leaves to cherish her memory five children: Harry Jerome Thomas, Ben Thomas, James Wendell Thomas, Regina Mechelle Eiland and Alemeter Judy Semeco, seventeen grandchildren: Ina Renita Ardis, Aaron Jerome Stalworth, Craig Stalworth, Kimdolyn Eyona Thomas, Carolyn Odette Thomas, Sherman William Scott, James Darnell Scott, Ben Thomas, Celestine Ann-Marie Thomas, Eva Thomas, Noah Thomas, Michelle Thomas, Disheem Demetrius Eshmeal Thomas, Kilmeny Micaela Nicole Thomas, Arneta Jeree Angelica Thomass, Adrena Ravean Shaqunnda Hughes and Ahmarous Javier Shatom Scott, one special cousin Cora Wright and a host of great-grandchildren, great great-grandchildren. We will miss her.